UP & GO - For People on the GO! Australia's No1 Seller Breakfast drink has landed here at Dhamecha! Featuring 3 variants packed with Fibre, Calcium & Protein it's all your customers need to create that early morning bounce to get UP & GO. Look out for the Demo's at your local depot! EXCLUSIVE DEALS 22-28 JUN, Visit your local depot for Prices that Matter e.g. Pampers Nappies PM £4.99 3xVAS £7.49, Flash Liquid Lemon 6x1ltr £7.99 BOGOF! 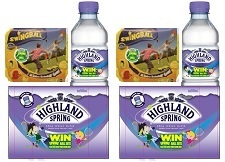 Over 1,000 prizes to be Won On Highland Spring shelf promotions packs, running on all still SKU's until 29.06.15. Visit your local depot now and pick up these promo packs, giving your customers a chance to WIN sports equipment. Over 1,000 prizes to be Won! Highland Spring are getting families active and offering them the chance to win Swingball Sets & Mini Tennis Kits. Please use your full 6-digit account number to log in (eg. if your account number is 4096, enter 004096). close If you have forgotten your password for this site please enter your email address below. close If you have forgotten your Customer Id for this site please enter your email address below. Welcome to our new website. Please use your full 6-digit account number to log in (eg. if your account number is 4096, enter 004096). New users will receive an email with an activation link where they have to click to define their password and be able to access the website. Existing users can continue to log in as usual.